Anyone who has a raised a puppy, or has an older dog, has dealt with pet urine spots in carpet. We love our pets and can’t begrudge them an accident or two, but sometimes it’s a real problem. Pet urine in carpet is difficult to clean, if it’s not removed before it dries it’s almost impossible to get out. Once it dries the pet urine crystalizes, damaging your carpet fibers, backing, and ultimately the pad underneath. Pet Urine is more than just a stain it actually damages your carpet. When it gets warm or humid, which is often the case in Tampa FL, pet urine crystals release ammonia (that’s the main odor component of urine) that can off gas for up to five years. It is also a perfect breeding ground for bacteria and other biological hazards. All this sounds so terrible but there are ways to remove pet urine stains from carpet. I have been in the carpet cleaning business for a long time and I’ve used a lot of methods to remove Pet stains and odors from carpet but nothing works like this. Chem-Dry has a simple and effective solution for cleaning fresh urine stains in carpet without having to hire a professional carpet cleaner. Chem-Dry’s World Famous Spot Remover and Pet Odor Remover can completely wipe out pet urine stains and odors in your carpet. 1. When you find a fresh urine (it works with all types of urine) spot in your carpet soak up as much liquid as possible with a clean white towel. 2. Spray the spot with Chem-Dry’s World Famous Spot Remover and let it dwell for thirty seconds, then remove the excess solution with a clean white towel. 3. 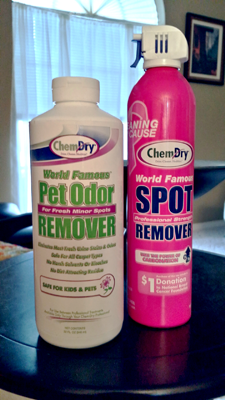 Pour Chem-Dry’s Pet Odor Remover on the Urine spot and let it soak into the carpet and pad underneath, about 30 seconds. Then remove the excess solution with a clean white towel. 4. Apply the pet odor remover again to make sure it has gotten to all the urine. Then remove the excess solution with a clean white towel. 5. Finally, lay a towel over the spot to make sure it stays wet for 24 hours. This will oxidize the urine crystals, breaking down the stain and releasing all the ammonia. When it dries completely the urine smell will be gone and the spot will completely disappear. Keep in mind that if the spot is wet it will smell like urine until it completely dries. If you’re finding pet urine stains after they have dried call Chem-Dry of Tampa FL, (813) 402-8403. We have a solution for that too, called PURT.